When the muse strikes some authors are just unable to stop writing and I believe Jennifer Joy fits perfectly in that category. She started out by writing JAFF romances, specialised in mystery novels within the genre, ventured into the modern cozy mysteries and now she is starting a whole new sweet contemporary romance series called the Starlight Terrace Proposals. These new books are not Jane Austen Fan Fiction but P&P inspired novellas that the reader can enjoy in a couple of hours. They are perfect for those who do not have much time to read, but want to relax with a sweet clean romance. The first book in the series, Written in the Stars, was released last Thursday and to celebrate this she launched the book at a discounted price so that readers can steal it for 99 cents. This promo will be live only through this weekend, so grab your copy fast! Sunday night the sale ends and it’ll go back to $2.99. But I bet you want to know more about this new project so I’ll let you read Jennifer’s post where she describes where her inspiration came from and what readers can expect from this series. Inspiration is everywhere. One of the most frequent questions I get as a writer is: Where do you get ideas? In this case, it came from one image in a scene of a movie I’d seen dozens of times. If you’ve seen the movie, The Bachelor, with Chris O’Donnell and Renée Zellweger, then you’ll know which scene I’m talking about. It’s the one where our hero takes an elevator to the Starlight Room in San Francisco with several other gentlemen looking uncomfortable and nervous in their suits and ties. The elevator dings, the door opens, and each of them step out to embrace the woman he will propose to that night. That’s when inspiration hit me! I wanted to tell the stories of the men in the elevator; of their struggles to propose to the women they love. Unlike the movie, I wanted these men to want to propose, but to show how much they loved their would-be brides by overcoming the obstacles thrown at them (sorry to give you so much trouble, guys) before they could achieve their ultimate goal. And so The Starlight Terrace was born. Being a Pacific Northwesterner, I changed the San Francisco setting to one I’m more familiar with — Seattle, and I pieced together my idea (Thank you, Pinterest!) of a perfect, romantic restaurant with candlelight, spectacular views of the Space Needle and Puget Sound, soft jazz from a live band surrounded by twinkle lights, a menu to rival the finest five-star restaurant, and champagne. Elizabeth Bennet became Liz Benetti, a boisterous book blogger who loves to give voice to her opinions and discuss her favorite books with readers of her growing blog. It so happens that Benetti’s Italian Restaurant was the restaurant to go to where I grew up, so I had Liz come from an Italian family in the restaurant biz. It was fun to write Will and Liz in love from page one, but I used her tendency to misunderstand him to advantage in this novella. She doesn’t see his proposal coming. Lovers of Pride & Prejudice will find lots of little gems hidden in the manuscript. Can you find Lady Catherine and Mr. Bingley? They make cameo appearances! Future novellas in the Starlight Terrace Proposals will feature a variety of personalities and professions … everything from an accountant to a policeman … until the elevator to the Starlight Terrace can’t hold any more. Or until I find a new restaurant for the women! Ooh, now there’s another idea! Thank you for inviting me today, Rita! Liz loves your blog! Don’t you agree this one was also quite horrible? I wonder how Will Donovan will propose to Liz Benetti in Written in the Stars! Is it even worse than what we just saw? Well..I guess I have to leave my computer, grab my kindle and start reading this novella to find out!!! Meet … fall in love … propose. Easy, right? Will can write a best-selling novel. But can he write the perfect proposal? Will Donovan, a literary author whose novel has been nominated for its film adaptation at the Sundance Festival, writes what he can’t articulate. In the romantic Starlight Terrace, he plans the perfect proposal for Liz Benetti, an outspoken book blogger and talented voice-over artist, only to learn that she’s close to uncovering a secret he’s worked hard to keep quiet. Can Will keep his secret and Liz’s heart or will his perfect proposal mean the end of his career? 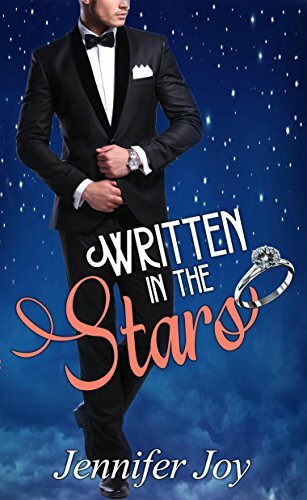 Written in the Stars is the first in Jennifer Joy’s new series set in the romantic Starlight Terrace, where soft jazz, sparkly champagne, and the finest food in the Pacific Northwest inspires proposals and new beginnings. If you like sweet romances with happy endings and a touch of humor you can read in one sitting, you’ll love sharing in the most significant night of these men’s lives as they struggle to propose to the women they love. Read Written in the Stars to satisfy your craving for clean, sweet contemporary romance today! Oh, this sounds delightful… I grabbed it right away. I can’t wait to read it. Thanks Rita for the post, and thanks Jennifer for the launch price. Blessings on the launch of this exciting idea. When I received Jennifer’s post just yesterday, I squealed! I have bought the book and can’t wait to read it! Yep ‘The Bachelor’ proposal was just as bad as Darcy’s! Congratulations Jennifer and thank you Rita!!! Lovely to see another new work from Jennifer, and in another genre, too. I’ve just finished Cold Case Crumble, which I loved, though I do wonder how many dead bodies a small town in Ecuador can support! A bit like Murder She Wrote (US) or Midsomer Murders (UK), I guess. I’ve never seen The Bachelor, but oh my goodness, that proposal is cringe-worthy indeed! Certainly gives Darcy a run for his money, possibly even worse as this guy doesn’t even seem to be able to utter a complete sentence. At least Darcy was painfully articulate with his reasoning. Looking forward to following all of these gentlemen on their quests to secure the affections of the women they love. This sounds like such a great story! Poor Will,able to write what he cannot articulate orally,all set up propose……but Fate may have other ideas! Can’t wait to read it! Cheers for such a lovely post! Best of luck with this one,Jennifer! I loved reading the inspiration for this one, and thanks so much for letting me know about this new book. I’m looking forward to reading it soon. And congrats to Jennifer on the new release!